While often times plastic paddle holsters get most of the attention, there are also many various types of leather paddle holsters. That is the beauty of opinion; there’s a variety out there to fit everyone’s individual tastes. What is the best leather paddle holster, then? With limited options out there, you probably want to make sure you are picking the perfect one. While we cannot mandate what is truly the best since there are so many types of opinions and people, we can show you our favorite and a few other options we like. Our top pick, out of the options we’ve researched and experienced, has to be the Galco Combat Master Belt Holster. It is a top quality design made with genuine leather. While it is like most leather holsters and needs breaking in, it will last you for a long time. Before we get into the list of a few other holsters, however, let’s talk about the kinds of retention. Just like with any other holster, paddle holsters have different levels that will determine whether it is right for you or not. The level of retention refers to the ability of the holster to hold your pistol in place within it. The number of retention devices determines the level. Typically the levels only reach level 1, level 2, or level 3. Depending on your preference, you’ll want to become familiar with what each level brings to the table. Ultimately it all depends on whether you want more control over the security of your gun, or if you want to be able to draw it fast yet leave it more vulnerable. With passive retention the wielder is the one responsible for the retention. It’s dependent on the person initiating the release and retention, rather than the device itself. Passive retention can usually be classified as things like thumb brakes and flaps. In essence, you are responsible for fastening them into place. Active retention is a newer technology. This system makes it so that the wielder doesn’t have to activate the mechanisms, but rather the holster does the work. The gun is pressed into place, and the retention activates. The mechanism must be held in the “off” position for your firearm to be drawn. These systems prevent the occasional, and accidental, unfastening of the passive features. This is the lowest of the popular levels of retention. It has no mechanisms or devices holding the firearm in the holster, other than the pouch your pistol resides in. This would be the quickest draw since all you have to do simply draw, like depicted in Western movies. However, your gun is more susceptible to being taken by outside forces. Thus, though it may be a fast deployment, it is not at all the most secure. With Law enforcement and the military, level 2 is the minimum requirement. Generally, there is only one device used, such as a strap or lever. You can usually expect it to be some sort of thumb-brake. While it’s not as fast of a draw as a level 1, it’s still quick and extremely convenient. It is recommended new owners spend some time practicing the drawing process with this to get used to it, as it can be awkward to adjust to a retention device. There is some confusion between level 1 and level 2, and you might find a holster of this description labeled as a Level 1. This is a common mistake in the holster manufacturing world, but you can easily spot the difference with some training. It can start to get a little tricky at this point. Level 3 combines the uses of a level two, plus a few additional mechanisms and steps to take. Generally, there are certain amounts of pushing, pulling, and holding to get your weapon out of this level of retention with a holster. While they are secure and make it incredibly difficult for a perpetrator to get their hands on–often impossible–they can be tedious and hefty for the wearer. The level of retention goes as far as a level 4 or even a 5. These can get extremely tricky, which is why you won’t hear much about them anywhere. But for those that want to keep their firearm from having any possibility of slipping out or being stolen off their person, these holsters are the safest, by comparison. Just don’t count on being able to get the gun out in a timely fashion. 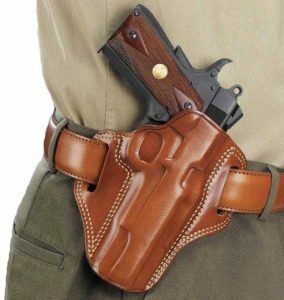 The main reason for confusion with retention comes down to the amount of devices applied to the make of the holster. Many think the level has to do with how many mechanisms there are, when in reality this might not be the case. It comes down to, mostly, the steps that need to be taken in order to remove the pistol from the holster. While there is plenty of common misunderstandings with retention, a little bit of studying will train your eye to recognize retention level with little more than a glance. In a simulated attack between the two, person number two must tug on the pistol in all directions, without deactivating the mechanisms such as straps or flaps. For five seconds, they attempt to remove the weapon. If it is not dislodged, the holster is deemed a level 1. Now let’s move on to the top choices, and hopefully we can help you to come to a satisfied conclusion of what will be the best fit for you. For a quality, genuine leather holster this one is just the right pick I think. 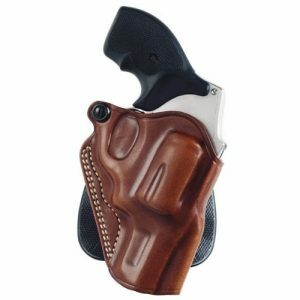 Being made of 100% saddle leather and double stitched seams, this hand-molded holster is a great option. 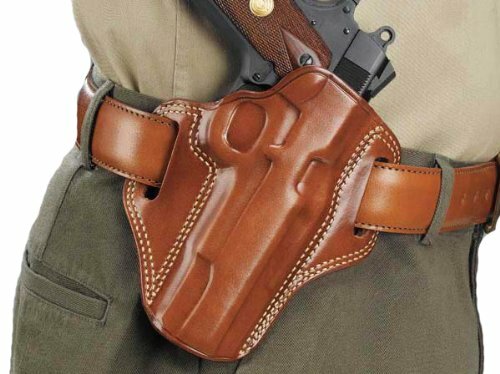 Being a popular manufacturer in the holster industry, Galco is bound to come up a few times. Here is another one of their holsters that is another great option if you’re looking for a paddle style. It is designed for speed, comfort, and reliability. Another Galco, this is prime for those who prefer a high riding holster. The materials are top quality, and it is designed for maximum comfort. 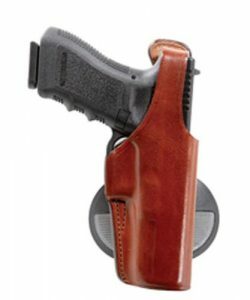 This holster is a combination of a thumb break belt holster and a paddle holster, giving you the benefits of both. It is well designed, with premium materials and good retention that you can depend on. While there are a few great options out there, our favorite is the Galco Combat Master Belt Holster. It is made of great quality material and has all the good qualities to look for. Nevertheless, there are other choices to suit the different kinds of people. We hope you’ve found a good holster in the list above. 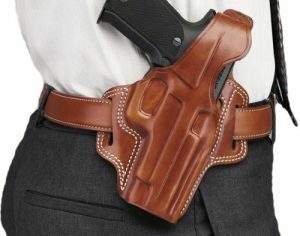 There are many options for you but we try to provide the top quality holsters in our articles. Remember to take into consideration the retention type and level, and you will find yourself the perfect match. If you want to see more holster reviews, you can find them on this link. I suppose somenone should mention that the Combat Master isn’t a paddle holster.